In my Stampin' Up! online store you will find a Clearance Rack (look up on the menu of the left side when you're on the store page or type into the search bar). Waiting for you to snaffle them up are some ridiculously cut price fab quality ex catalogue items (retired stock as Stampin' Up! calls it). There are papers, dies, ribbons and embelishments and it is updated regularly but does sell out pretty fast and all of the items you see are available subject to availability. I've linked below all of the Christmas items which were available at cut prices at the time of writing this post. Links do show original full price but when you start shopping you'll see the huge discounts on these items. 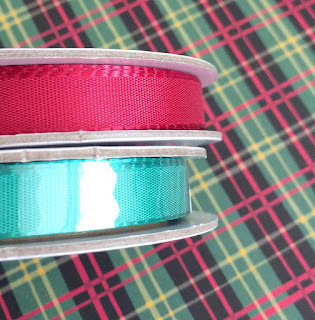 For instance this double pack of taffeta ribbon, 4 yards on each spool is currently just £3.30. In traditional festive colours and coordinating with other items in the Clearance Rack and in the current product ranges in both the annual and Autumn/Winter catalogues this high quality pretty ribbon really is versatile in your paper crafting, gift wrapping and also for non paper craft projects such as sewing and knitting projects. You can mix Clearance items with main catalogue items and with the new Autumn Winter catalogue items when placing an order no problem. So go ahead and build that stash with fabulous quality Stampin' Up! products. The clearance rack really does give you a chance to sample how amazing Stampin' Up! products are. Don't just take my word for it. Let me know if I can help with anything. Thanks for dropping in as always.